Time: Batch cooking lets you save time. Rather than cook breakfast every morning or worry about dinner on your way home from work, you can simply pull out a pack of muffins or roasted chicken from the freezer to reheat. Energy: It also helps you save on energy. For example, you can cook multiple dishes in the oven to save on cooking time and electricity or gas use. Money: Finally, batch cooking can help you save money. Creating a shopping list good for a week not only reduces those extra trips to the grocery store but also lets you purchase exactly what you need. Moreover, cooking meals from scratch is cheaper than buying restaurant food. Batch cooking lets you use your perishable food before they go bad. And by storing them in the freezer, they stay fresh longer, too. Home-cooked meals are generally healthier and free from preservatives. By being in control of what goes into every meal, you can easily prepare nutrition-packed meals for your family. To keep you from serving the same food every time, batch cooking encourages you to add variety to your meals. For instance, it lets you mix and match food items with different colours, flavour, and texture. With herbs and seasonings on hand, batch cooking can also motivate you to spice up a regular dish or whip up something new. Probably one of the important benefits of batch cooking is to help you stay relaxed and organised despite your busy days. By planning ahead, you don’t have to resort to unhealthy instant food for lunch or make meals after a tiring work day. Planning meals in advance means saving a lot, eating healthier, and enjoying a stress-free work week. Before you start cooking food in bigger batches, you need to prepare your kitchen for it. Cookware with large capacities, baking dishes and trays, freezer-safe containers, plus a trusty freezer are some of the basic tools you need. Match your meal plan with the kitchen tools you have on hand for smooth-sailing meal prep. Top-notch knives are important for an easy, quick, and safe prep time. Knives in good condition help reduce the effort you need as well as mistakes you might make when chopping several ingredients. Cutting boards dedicated for meat, poultry, and fresh produce are also great for avoiding food contamination. For more precise and quicker prep results, having a food processor helps, too. Save time during batch cooking by cooking everything in big pots and pans. A large stockpot or stewpot is perfect for soups, stews, and broths, while a versatile sauté pan can be used for pan-frying, sautéing, and more. It’s best to have durable pots and pans that can withstand heavier kitchen use and are compatible with various heat sources. Heavy-duty stockpots let you cook in batches to save time and energy. Pressure cookers are absolute timesavers as they can cook your meat dishes in less time. They also help keep food nutrients intact. Slow cookers, on the other hand, help you multitask. Pair these smart cookers with your collection of dump-and-go recipes so you can work on your other freezer-friendly meals. The oven is perfect for cooking multiple dishes at one time. So make the most of it by having roasting pans and durable baking dishes on hand. Muffin or mini cake tins are also great to have in your repertoire as they are perfect for cooking food in individual portions that are easier to pack and freeze. Have a good set of bakeware for cooking roasts and baking snacks. Once your cooked meals have cooled down, you will need containers and bags to store them safely in the freezer and in portions. Make sure to find freezer-safe containers with good seals and flat lids so you can stack and save space. 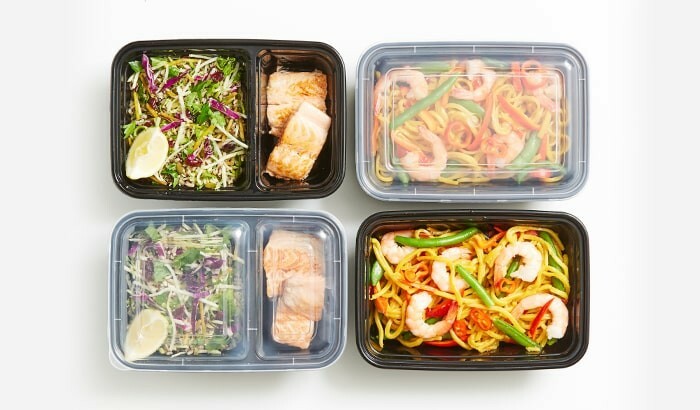 Meal prep containers with compartments are great for packing complete meals. For cooked soups and stocks, one good trick is to freeze them in ice cube trays. Once frozen, you can unmould and portion them into freezer bags for storage. Microwave-safe resealable bags that can be reused are also perfect for your weekly cooking spree. And if you plan to store certain meals for longer, vacuum sealers efficiently remove all the air out to protect your food from freezer burn. To help you keep track of all your stored meals, have a stash of tape, markers, and other labelling supplies to mark your containers and bags. Label each with its contents, serving size, and shelf life before it goes in the freezer. Writing brief instructions on how to cook or reheat them may also be helpful in case you’re not home to do it. Keep in mind that while the freezer prolongs the shelf life of your cooked food, it won’t stay fresh there forever. So practice first in, first out (FIFO) when storing. Place the items with shorter shelf lives at the front so you can eat them first, while newer ones stay at the back for later consumption. Store your cooked food in clean containers and cool them completely at room temperature before freezing. With your kitchen now equipped and your ingredients ready, you can now begin whipping up those delicious meals. There are two ways on how you can cook in bulk. One is by cooking complete dishes, portioning them into individual containers, then storing them in the freezer. The advantage of this method is that frozen complete dishes need no further cooking or preparation—simply thaw them, reheat, and serve. Meal prep containers come in handy when batch cooking complete dishes. The other method is to cook individual ingredients that you can use to make a variety of dishes. For example, you can par-boil pasta noodles for freezing then thaw them to mix in with your bolognese and pesto sauces. While it may require further cooking, this is minimal. The good thing about this method is that you can easily break meal monotony without spending so much time preparing different dishes for the entire week. Try doing this technique for cooked chicken, soup stocks, roasted vegetables, potatoes, and grains. Turn grilled chicken into wraps and salads, while blanched veggies are great when tossed in butter or added to a stir-fry. Without a doubt, batch cooking does require a bit of your time and effort. But once you get the hang of it, it is a good habit that is truly rewarding. And to help you get started, we’ve listed down a few other tips that will make your batch cooking experience easier and fun! If no one in the family says no to potato or pasta dishes, then include these into your weekly meal plan. As you will be cooking in bigger volume, it’s wise to make dishes that will not go to waste and everyone will enjoy eating. Moreover, cooking with recipes that you know by heart will make you work more efficiently. Having an organised pantry lets you see what you have in stock and what you need to buy. Make sure to have a good stock of sauces, grains, dairy, and condiments that will help you finish your frozen pre-cooked ingredients or spruce up last night’s leftovers. Freezing cooked food does prolong its shelf life, but it should be done the proper way to avoid contamination and spoilage. Make sure that your cooked food will be stored in clean and dry containers. Cool your cooked food fully at room temperature before freezing it. After 2 hours of cooling, make sure to refrigerate or freeze it immediately to stunt bacterial growth. Freeze your food at -18C and thaw it in the fridge at no more than 5C. Finally, do not refreeze thawed food as freezing it for the second time can lead to higher bacterial count. No one wants a flat muffin for breakfast. So once your baked batch of goodies has cooled down, place them on a tray then freeze for an hour or so. When frozen solid, you can easily pack or stack them in bags without sticking or losing their shape. Kitchen time means bonding time. So make your kids, friends, or partner a part of your batch cooking brigade and let extra hands help you prepare food faster. Play your upbeat playlist or exchange funny stories while cooking, and before you know it, you’ll be all set for the week ahead! Extra pairs of hands are definitely better than one when batch cooking!